128 pages | 155 B/W Illus. Chapter 1. Some introductory remarks to get us started. Chapter 2. Grammatical parts and how they work together. Analysing a more extended example. Chapter 3. Representing the world. Chapter 4. The speaker’s relationships. Chapter 5. Getting the message in order. Chapter 6. Extending the interpersonal metafunction. Chapter 7. Modelling the text. Chapter 8. The text in context. Chapter 9. Final thoughts: a launching pad. Key to Activities & Exercises. 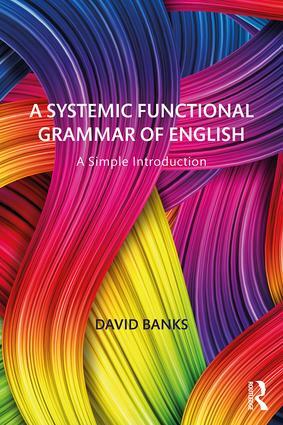 David Banks is Emeritus Professor at the Université de Bretagne Occidentale in France. He is former Head of the English Department, Director of Equipe de Recherche en Linguistique Appliquée (ERLA) and Chairman of Association Française de la Linguistique Systémique Fonctionnelle (AFLSF). He is author or editor of 30 books and has published over 110 academic articles. His publication The Development of Scientific Writing: Linguistic features and historical context (2008) won the European Society for the Study of English Language and Linguistics Book Award in 2010. His research interests include the diachronic study of scientific text and the application of Systemic Functional Linguistics to English and French.